Starting in 1956, I worked at the Vine Street Market for four summers as a delivery boy and gained a lot of personal experience in how these stores operated. Vine Street was owned by Russ Wheeler and Douglas Beville, who ran the meat market.The store opened at 7:30 a.m. Russ Wheeler had already been to the farmer's market and brought back watermelons, peaches and fresh produce in his green Ford station wagon. 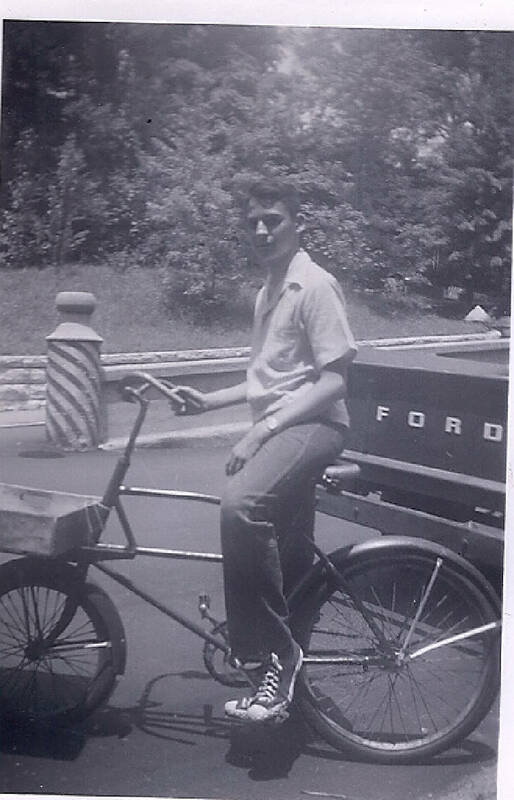 Our first job was to stack the watermelons on the sidewalk in front of the store and then bring out the three delivery bicycles for a day of hard riding.Soon the telephones began to ring. The first calls were for small orders — milk, bread, a slice of watermelon or hamburger meat. Within an hour, I was on the bike making deliveries. This continued almost non-stop all day.On Fridays and Saturdays, customers called in very large orders. Sometimes we got behind and as the orders piled up, we went as fast as we could to get them delivered. Occasionally, Mr. Wheeler took pity on us and used the station wagon to help us catch up. Our coverage area extended roughly from Georgia Avenue on the west to Central Avenue on the east, to McCallie Avenue on the south and to the Tennessee River on the north. Within this area, we served probably 200 customers.Sometimes the orders were very heavy and had to be hauled up several flights of stairs in one of the many apartment buildings nearby. We were expected to put the groceries out on a kitchen table, take back empty pop bottles and perhaps change a light bulb or take out the garbage. Rarely did we get a tip. The work was hot and difficult. There were hills in every direction, and the temperatures by 10 a.m. were often in the 90s. Rain was a blessing because it cooled us off. We put a tarp over the groceries and just kept going.In addition to the delivery boys, there was a stock boy, who kept the store's shelves filled. The stock truck came on Thursday afternoon. The driver unloaded boxes of canned goods and stacked them in the middle aisle of the store. Every case had to be opened, and its contents put on the shelves or taken upstairs to the stock room before we could go home that evening. During the day, other suppliers showed up with bread, milk and ice cream, while sides of beef, chickens and pork were delivered to the meat market.In addition to delivering groceries, our jobs included sweeping the floors, preparing produce, cleaning milk coolers, and sorting empty bottles. We didn't have time for lunch, and we often worked well beyond the store's closing hour of 7 p.m. (9 p.m. on Saturdays). I made the grand sum of 30 cents an hour.Over the years, I have thought often of those summers at Vine Street Market. I remember kindly Russ Wheeler, who gave away groceries to needy families in the neighborhood, Doug Beville and Frank Gang in the meat department, assistant manager Bill Foster, and the other boys—Mack, John, Roy, Ralph, Billy, James and Joe. I often wonder what happened to them.I remember the retired people in the neighborhood who depended on us to bring them groceries, and I also recall when the store burned down in 1959. Most of all, I remember the joy of being outside all day, working hard and meeting all sorts of wonderful and interesting people. To this day one of my great pleasures is riding my bicycle for hours.Slowly the neighborhood changed. People moved away. The university bought up several blocks for a growing campus, and now all of these stores are gone. Today, we drive to the supermarket, fill our own carts, pay "credit or debit," haul the plastic bags to our cars, drag them into the house, set them out on the kitchen table ourselves — and think that this is the way it has always been.Dr. Henry Aldridge is an Emeritus Professor of Film Studies at Eastern Michigan University. He grew up in Chattanooga and attended Bright School and McCallie School. For more visit Chattahistoricalassoc.org. Before supermarkets came to Chattanooga, many neighborhoods were well served by small, locally-owned grocery stores. I grew up on Houston Street where the UTC indoor courts are today. In the 1950s, there were at least six grocery stores nearby. The Mark Gang Grocery and the Vine Street Market were the largest. They delivered, had charge accounts, and took telephone orders. Starting in 1956, I worked at the Vine Street Market for four summers as a delivery boy and gained a lot of personal experience in how these stores operated. Vine Street was owned by Russ Wheeler and Douglas Beville, who ran the meat market. The store opened at 7:30 a.m. Russ Wheeler had already been to the farmer's market and brought back watermelons, peaches and fresh produce in his green Ford station wagon. Our first job was to stack the watermelons on the sidewalk in front of the store and then bring out the three delivery bicycles for a day of hard riding. Soon the telephones began to ring. The first calls were for small orders — milk, bread, a slice of watermelon or hamburger meat. Within an hour, I was on the bike making deliveries. This continued almost non-stop all day. On Fridays and Saturdays, customers called in very large orders. Sometimes we got behind and as the orders piled up, we went as fast as we could to get them delivered. Occasionally, Mr. Wheeler took pity on us and used the station wagon to help us catch up. Our coverage area extended roughly from Georgia Avenue on the west to Central Avenue on the east, to McCallie Avenue on the south and to the Tennessee River on the north. Within this area, we served probably 200 customers. Sometimes the orders were very heavy and had to be hauled up several flights of stairs in one of the many apartment buildings nearby. We were expected to put the groceries out on a kitchen table, take back empty pop bottles and perhaps change a light bulb or take out the garbage. Rarely did we get a tip. The work was hot and difficult. There were hills in every direction, and the temperatures by 10 a.m. were often in the 90s. Rain was a blessing because it cooled us off. We put a tarp over the groceries and just kept going. In addition to the delivery boys, there was a stock boy, who kept the store's shelves filled. The stock truck came on Thursday afternoon. The driver unloaded boxes of canned goods and stacked them in the middle aisle of the store. Every case had to be opened, and its contents put on the shelves or taken upstairs to the stock room before we could go home that evening. During the day, other suppliers showed up with bread, milk and ice cream, while sides of beef, chickens and pork were delivered to the meat market. In addition to delivering groceries, our jobs included sweeping the floors, preparing produce, cleaning milk coolers, and sorting empty bottles. We didn't have time for lunch, and we often worked well beyond the store's closing hour of 7 p.m. (9 p.m. on Saturdays). I made the grand sum of 30 cents an hour. Over the years, I have thought often of those summers at Vine Street Market. I remember kindly Russ Wheeler, who gave away groceries to needy families in the neighborhood, Doug Beville and Frank Gang in the meat department, assistant manager Bill Foster, and the other boys—Mack, John, Roy, Ralph, Billy, James and Joe. I often wonder what happened to them. I remember the retired people in the neighborhood who depended on us to bring them groceries, and I also recall when the store burned down in 1959. Most of all, I remember the joy of being outside all day, working hard and meeting all sorts of wonderful and interesting people. To this day one of my great pleasures is riding my bicycle for hours. Slowly the neighborhood changed. People moved away. The university bought up several blocks for a growing campus, and now all of these stores are gone. Today, we drive to the supermarket, fill our own carts, pay "credit or debit," haul the plastic bags to our cars, drag them into the house, set them out on the kitchen table ourselves — and think that this is the way it has always been. Dr. Henry Aldridge is an Emeritus Professor of Film Studies at Eastern Michigan University. He grew up in Chattanooga and attended Bright School and McCallie School. For more, visit Chattahistoricalassoc.org.